2 cans of 14.5 ounce Dark red kidney beans - you have to drained and rinsed it. Heat the pressure cooker over high heat until hot. Add the ground beef and turn it brown and crumbly from all sides on a medium high heat for around 8-10 mins. Once brown, remove the beef and drain the excess fat. Scrape the browned bits from the bottom of the pot. Place the pressure cooker back on the burner over a medium heat. Pour in the olive heat. Place the meat back into the pressure cooker adding kidney beans, tomatoes (dice and paste), brown sugar, red pepper flakes, cumin, salt, cocoa powder, chili powder and water. Close the lid. lock it and place it on a high heat. When you feel the heat hissing out, reduce the temperature and cook it for about 10 minutes. Your chili is ready to be served hot. 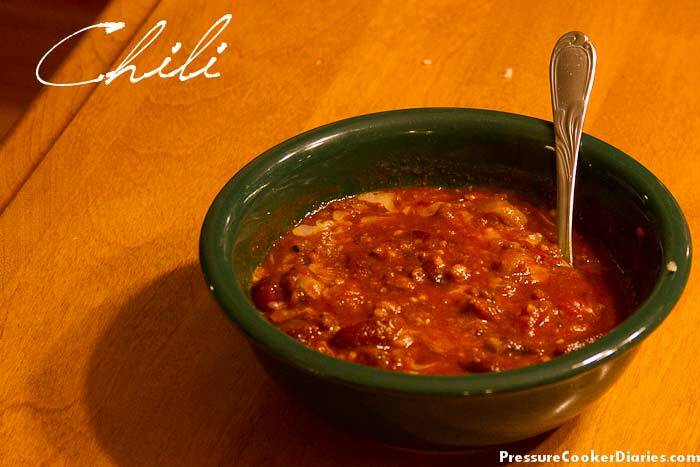 Nothing can be more tempting than a delicious Chili on a cold windy night. This can be an apt recipe for a surprise candle light dinner planned for your mate.